I’ll let you in on a secret. Sparring makes everyone, novice and black belt, anxious. The secret is to observe the process and make the mental commitment to attend the session. Let your trainer know and they will give advice and encouragement as needed. I guarantee that your trainer wants the best and safest experience for all participants. Most of all, celebrate your courage in attending, and hold tight to the feeling of exhilaration when you finish. Remember that feeling when the anxiety roller-coaster starts again! Your trainer probably reminds you to keep your guard up continually in class. You will find out why in sparring. The funny thing is that after a sparring session you will rarely drop your guard again! 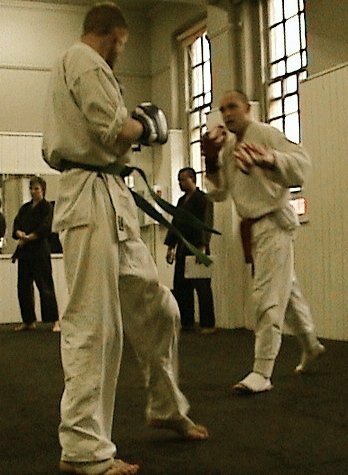 The best sparrers have a repertoire of combinations involving strikes, kicks, take-downs which have been drilled into their muscle memory over the years. They can unleash them, often seemingly without thought. The first step on that path to mastery is to start building your armoury. Develop some basic combinations that you can go to when needed. While counterpunching and striking has its place in sparring if all you can do is one off pot shots you will be taken apart by a more experienced sparrer in a clinical fashion. Obviously a mouth guard is a must, unless you have no teeth already! But seriously, a small investment in a mid level mouthguard, properly fitted, will pay off in spades. I find the rugby mouthguards from sports stores are a great choice and a step up from the chemist ones. Take the time to follow the instructions and fit the guard as best as possible. For dedicated competitors I strongly suggest a dentist fitted professional sport mouthguard. A tip – wear your mouthguard for a normal class and get used to breathing with it in. It’s very hard to spar when you are struggling for breath so test your fitness out beforehand. Sparring is not fighting, but hopefully it is the closest approximation we shall ever face! I often see novice sparrers tightening up and hunching down. Stay as loose as possible and fight as big as possible. Have you ever seen how a bear rears on its hind legs? But…. don’t drop that guard! As in life, communication is key! Talk to your sparring partner, ask them to lighten up if they are hitting too hard. Talk to your trainer, senior students and ask advice – you will gain plenty of tips and pointers. Quantum Martial Arts and Northstar Martial Arts has an incredibly experienced community of martial artists with decades of experience and is led by one of Australia’s premier practitioners Sensei Andy Dickinson. Members of the system have competed nationally and internationally. To approach sparring thinking you will not get tagged is unrealistic and at a deeper level is a function of the ego’s need for attachment to the outcome of ‘winning or losing’. It is better to embrace the reality of the situation and ‘roll with the punches’ as they say. Personally I take my gloves and lightly wack my face and nose beforehand. It helps to make me present for the sparring engagement. Funny how many times a sparring partner offers to do that for me! In the wild, predator animals practice by tussling and play fighting. I approach sparring as robust play. Enjoy the process and the debrief afterwards. Celebrate your courage and the knowledge that you are facing fears in a very practical way that has deeper impacts on your approach to life. At Quantum we often have a beer or soft drink afterwards. Some of my best mates are people who have punched me in the face… weekly! We would love to hear what your top sparring tips are! Please comment below!